This calculator will calculate the percentages and distribution amounts for your own hybrid envelope budgeting system. Plus, unlike other online envelope budget calculators, this calculator will even calculate the size and number of the bills you will need in order to make precise cash distributions to your envelopes. Cool! The calculator allows you to enter any number of envelopes, as well as to edit or delete your envelopes after you have added them. And finally, the calculator also includes a printer friendly report feature so you can print out the results for later reference. Calculate percentages and distribution amounts for your own hybrid envelope budgeting system. Enter your monthly take-home pay (after taxes and deductions), or your monthly allowance, whichever applies. The cash budgeting calculator will calculate what percentage each monthly envelope amount represents of your total monthly income or allowance. Enter the amount of cash you want to distribute to your cash envelope system. 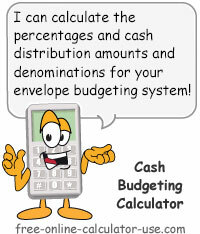 The cash budgeting calculator will calculate the envelope distribution based on entries in the next section. To add an envelope, enter the name, the periodic amount, and select the time period the amount applies to. When you're satisfied with the entries, tap the &plus; button (may also appear as "Add" or "Add Envelope" depending on the width of your device). To edit an envelope in the list, tap the radio button in the Edit column. This will load the envelope into the form for editing. When you're satisfied with the changes you've made, tap the S button (may also appear as "Save" or "Save Changes" depending on the width of your device). To delete an envelope from the list, tap the radio button in the Edit column. This will load the envelope into the form for deleting. Tap the − button (may also appear as "Delete" depending on the width of your device). To clear the form to create a new envelope entry, tap the C button (may also appear as "Clr" or "Clear" depending on the width of your device). Important! The entered envelopes are saved in your device's random memory (temporary storage), which means that if you surf to another calculator or close this browser window you will need to re-enter your envelopes. Enter the name of the envelope you want to add to your envelope budgeting system. Enter the payment amount you are most familiar with. For example, if you know you spend $100 per week on groceries, enter 100 for the amount and then select Weekly from the Frequency menu. 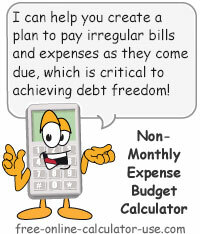 The cash budgeting calculator will automatically calculate the monthly equivalent. Select the payment frequency that applies to the payment amount you entered in the Amount field. This field contains the calculated monthly amount based on the entered payment amount and the selected payment frequency. This section will list the number and dollar value of the bills you will need in order to make exact cash distributions to your envelopes. This column displays each denomination. If you would rather not use hundred and/or fifty dollar bills, uncheck the checkbox for one or both. The denomination numbers and amounts will automatically recalculate when one of the checkboxes is checked or unchecked. This column displays the number of each denomination you will need to make exact cash distributions to each of your envelopes. This column displays the total dollar amount of each denomination you will need in order to make exact cash distributions to your envelopes. Enter your monthly net take-home pay. Enter the amount you wish to divide up between your envelopes. For each of your cash envelopes, enter the name, amount, and select the amount frequency. Then press the "+" button (may also appear as "Add" or "Add Envelope" depending on the size of your device). When you are satisfied with your envelope entries, press the "Printer Friendly Report" button. This will open a new window containing your cash disbursement report, along with the list of the dollar denominations and their corresponding numbers and amounts. What is a Cash or Envelope Budgeting System? In order to explain what an envelope budgeting system is, let's start with a very basic example. Suppose you get paid once per month and your monthly take-home pay is $1,000. Further suppose that you only have four expense categories, each with budgeted amounts of $250 per month. This means each category receives 25% of the take-home pay (250 ÷ 1000 = .25, or 25%). Using the envelope budgeting system, each time you receive your $1,000 net-paycheck you would deposit 25% of it ($250) into each of four envelopes -- each one labeled with one of the four expense categories. Now, as you progress through the month, each time you spend money you withdraw the expenditure from the appropriate envelope. When an envelope is empty, you know you've reached your budgeted limit for that category. Therein lies the power of an envelope budgeting system. 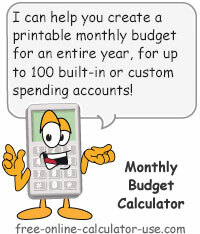 With other budgeting systems, all of your budget records are hidden within columnar tablets or in local or online budgeting software -- making it difficult to know exactly when you are approaching or exceeding your budget limits. This is made even worse when day-to-day expenditures are made using credit cards, debit cards, and checks -- all of which lead to what I call, "the budgeting abyss." The budgeting abyss is what happens when your budget is out-of-site, out-of-mind, and your spending occurs from multiple sources -- none of which are metered as a whole. This is similar to driving a car with an ever-changing miles per gallon rating, and having 5 different leaky gasoline tanks, all with faulty fuel gauges that are located in the trunk of vehicle. A vehicle like that could not be trusted to get you to where you want to go, and neither will a budget that is abysmal. You are spending from a single source. 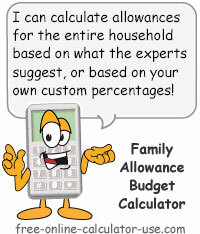 You always know exactly how much you have left for each budget category. An empty envelope is an inescapable indicator that you've completely exhausted the funds for a given category. It's much harder to part with cold hard cash than it is to sign a piece of paper with an amount on it. All that being said, considering today's nearly cashless society, there are many instances where paying with cash is neither wise, nor reasonable. For example, you certainly don't want to send cash through the mail to pay bills. And you probably don't want to carry an armload of cash into your mortgage holder to make your mortgage payment each month. And if you pay your bills online, setting aside cash for them doesn't make much sense. However, in spite of these cash limitations, there is still a way to use an envelope budgeting system that can harness its power, yet still accommodate cashless transactions. If you think about it, there are several areas in your budget where your tendencies to overspend don't really apply. For example, have you ever blown your budget because you compulsively paid more than the stated amount due on a debt or household bill? Probably not. So when it comes to regular debt payments and monthly household bills, the cash budgeting system would likely have no real effect anyway. So how might you implement the cash budget system to harness its power? It's those types of expense categories that are perfect candidates for a hybrid envelope budgeting system. So in the hybrid system, you would total up all of your debt payments and bills, and then subtract that total from your monthly take-home pay. Whatever is left, is what you would distribute to your cash envelopes. Determine a monthly amount for each envelope category. Divide each amount in step #1 by your total monthly take-home pay. Total up all of the results from Step #2. Divide each result in Step #2 by the result of step #3. Multiply each result in Step #4 by the amount of cash your are distributing. This should tell you how much cash should go in each envelope each time you go to distribute a new influx of cash. The way this usually works, is each time you get paid you deposit the amount needed to pay the current-period debt payments and bills into your checking account, and the rest you get in cash. You then multiply the amount of the cash by each envelope's percentage (Step #4 above) and put that amount into each envelope. Then, each time you leave the house, take whichever envelopes you think you might need and let the power of the envelope system keep you living within your means and progressing toward your goals. Once I explain the envelope system to someone who is new to the concept, the first objection I usually get has to do with a concern for having unusually large amounts of cash laying around -- all of which could be misplaced, stolen, lost in a house fire. My response is usually twofold. First, if you are not having problems living within your means and you are progressing toward your financial goals at a satisfactory pace, then you have no use for the envelope budgeting system. Your reserves of cash are probably less at risk if they are susceptible to loss, theft or fire versus being susceptible to your compulsive spending. If you have nothing to show for your past expenditures except for high-interest credit card balances, then what difference would it really make if an amount of cash was lost, stolen or burned up? Hybrid Envelope System Great for Allowances! If you've spent much time reading the content of this website, you probably know that I believe that regardless of who earns the money, or who earns the most money, every person in the household beyond the age of 6 should be given a monthly allowance to budget as they see fit. The older the family member, the more of their own expenses they become responsible for, and the higher their allowance. Whatever the allowance for each household member turns out to be, the envelope budgeting system is a great tool for all ages. Simply replace "monthly take-home pay" with "monthly allowance," and let each family member use the cash budgeting calculator to create their own envelope budget based on what is important to them. This is a great way to teach budgeting to kids at a young age, while insuring that everyone in the household has a vested interest in minimizing household expenses and paying off debt ... because it leads to higher allowances for everyone!